References _getWidget(), m_windowMain, s_delete_clicked(), s_destroy_clicked(), s_DetailsLevel_changed(), s_MainLevel_changed(), s_NumType_changed(), s_response_triggered(), s_set_style(), s_TabLeader_changed(), and s_Text_changed(). References _createLabelTypeItems(), _createLevelItems(), _createTABTypeItems(), _getWidget(), abiDialogSetTitle(), XAP_App::getStringSet(), XAP_StringSet::getValueUTF8(), localizeButton(), localizeButtonMarkup(), localizeButtonUnderline(), localizeLabel(), localizeLabelMarkup(), localizeLabelUnderline(), XAP_Dialog::m_pApp, m_pBuilder, m_wApply, m_wClose, m_windowMain, newDialogBuilder(), and s.
References _getWidget(), AP_Dialog_FormatFootnotes::getFootnoteTypeLabelList(), FootnoteTypeDesc::label, m_wLabelChoose, m_wPageNumberingChoose, FootnoteTypeDesc::n, FootnoteTypeDesc::prop, UT_DEBUGMSG, XAP_appendComboBoxTextAndIntString(), and XAP_makeGtkComboBoxText2(). References _getWidget(), XAP_Dialog::getApp(), XAP_App::getStringSet(), XAP_StringSet::getValueUTF8(), s, XAP_appendComboBoxTextAndInt(), and XAP_makeGtkComboBoxText(). References _getWidget(), gchar, UT_GenericVector< T >::getItemCount(), UT_GenericVector< T >::getNthItem(), AP_Dialog_FormatTOC::getVecTABLeadersLabel(), AP_Dialog_FormatTOC::getVecTABLeadersProp(), UT_DEBUGMSG, XAP_appendComboBoxTextAndStringString(), and XAP_makeGtkComboBoxText2(). Fill the GUI tree with the styles as defined in the XP tree. References _getWidget(), _setHasHeadingSensitivity(), FL_DocLayout::FootnoteTypeFromString(), XAP_Dialog_Modeless::getActiveFrame(), XAP_Frame::getCurrentView(), AP_Dialog_FormatTOC::getDetailsLevel(), FV_View::getLayout(), AP_Dialog_FormatTOC::getMainLevel(), AP_Dialog_FormatTOC::getTOCPropVal(), m_iIndentValue, m_iStartValue, s_check_changedDetails(), pt_PieceTable::s_getLocalisedStyleName(), s_HasHeading_changed(), s_HasLabel_changed(), s_Indent_changed(), s_StartAt_changed(), UT_UTF8String::utf8_str(), and XAP_comboBoxSetActiveFromIntCol(). References UT_String::c_str(), m_pBuilder, UT_return_val_if_fail, and UT_String_sprintf(). Referenced by _connectSignals(), _constructWindow(), _createLabelTypeItems(), _createLevelItems(), _createTABTypeItems(), _fillGUI(), _setHasHeadingSensitivity(), event_Apply(), event_IndentChanged(), event_StartAtChanged(), runModeless(), setDetailsLevel(), and setMainLevel(). Referenced by _fillGUI(), and event_HasHeadingChanged(). References _getWidget(), AP_Dialog_FormatTOC::Apply(), UT_String::c_str(), AP_Dialog_FormatTOC::getDetailsLevel(), AP_Dialog_FormatTOC::setTOCProperty(), UT_DEBUGMSG, UT_String_sprintf(), and UT_UTF8String::utf8_str(). References _setHasHeadingSensitivity(), UT_String::c_str(), AP_Dialog_FormatTOC::getMainLevel(), AP_Dialog_FormatTOC::setTOCProperty(), UT_String_sprintf(), and UT_UTF8String::utf8_str(). References UT_String::c_str(), AP_Dialog_FormatTOC::getMainLevel(), AP_Dialog_FormatTOC::setTOCProperty(), and UT_String_sprintf(). References _getWidget(), AP_Dialog_FormatTOC::getDetailsLevel(), AP_Dialog_FormatTOC::getTOCPropVal(), AP_Dialog_FormatTOC::incrementIndent(), m_iIndentValue, UT_DEBUGMSG, and UT_UTF8String::utf8_str(). References _getWidget(), AP_Dialog_FormatTOC::getDetailsLevel(), AP_Dialog_FormatTOC::getTOCPropVal(), AP_Dialog_FormatTOC::incrementStartAt(), m_iStartValue, UT_DEBUGMSG, and UT_UTF8String::utf8_str(). References _connectSignals(), _constructWindow(), _getWidget(), _populateWindowData(), abiSetupModelessDialog(), s_DetailsLevel_changed(), AP_Dialog_FormatTOC::startUpdater(), and UT_return_if_fail. References UT_String::c_str(), AP_Dialog_FormatTOC::getDetailsLevel(), m_wLabelChoose, m_wPageNumberingChoose, AP_Dialog_FormatTOC::setTOCProperty(), UT_ASSERT_HARMLESS, UT_SHOULD_NOT_HAPPEN, and UT_String_sprintf(). References _getWidget(), FL_DocLayout::FootnoteTypeFromString(), XAP_Dialog_Modeless::getActiveFrame(), XAP_Frame::getCurrentView(), AP_Dialog_FormatTOC::getDetailsLevel(), FV_View::getLayout(), AP_Dialog_FormatTOC::getTOCPropVal(), and UT_UTF8String::utf8_str(). References _getWidget(), AP_Dialog_FormatTOC::getMainLevel(), AP_Dialog_FormatTOC::getTOCPropVal(), pt_PieceTable::s_getLocalisedStyleName(), and UT_UTF8String::utf8_str(). 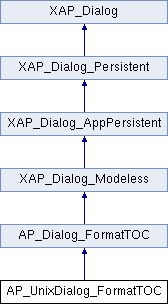 References AP_Dialog_FormatTOC::applyTOCPropsToDoc(), UT_String::c_str(), AP_Dialog_FormatTOC::getMainLevel(), AP_Dialog_FormatTOC::getNewStyle(), AP_Dialog_FormatTOC::setTOCProperty(), UT_String_sprintf(), and UT_UTF8String::utf8_str(). Referenced by _fillGUI(), and event_IndentChanged(). Referenced by _fillGUI(), and event_StartAtChanged(). Referenced by _constructWindow(), _getWidget(), and ~AP_UnixDialog_FormatTOC(). Referenced by _constructWindow(), and setSensitivity(). Referenced by _connectSignals(), _constructWindow(), activate(), destroy(), and notifyActiveFrame(). Referenced by _createLabelTypeItems(), and s_NumType_changed().